When we started trying to conceive, I admit I was super psyched about the idea of thrifting a maternity wardrobe. It seemed like a great excuse to go thrift a whole bunch of clothes without having to think about whether I really needed them. In other words, I suddenly felt content with my closet. Hormones? Pockets! 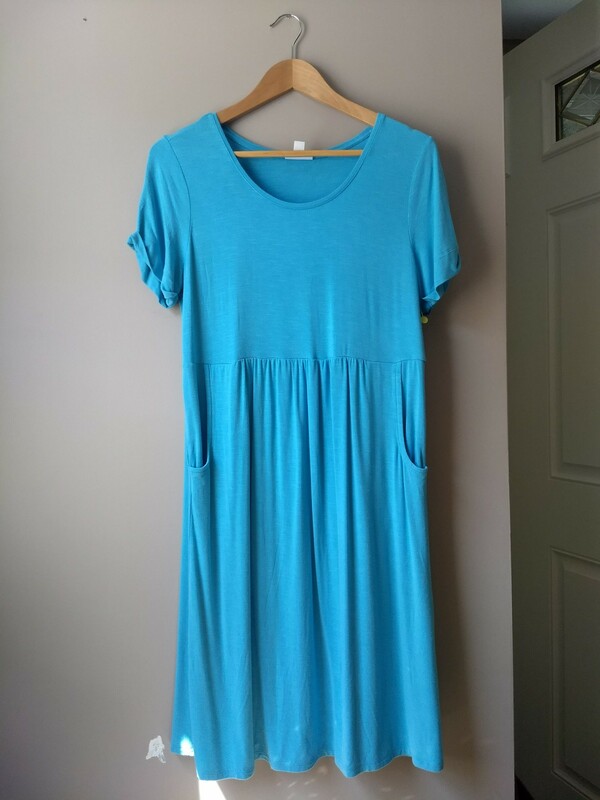 Thrifted J. Jill, found in the regular dress section. I have no doubt I’ll need to thrift more for colder weather; I don’t have any pants left over from last time and the few maternity sweaters I needed in Atlanta are in eye-burning color combos like electric purple and chartreuse (what was I thinking??). I’ll keep you all up to date! Shop your closet – don’t assume all your current clothes won’t work, particularly if you favor roomier styles. 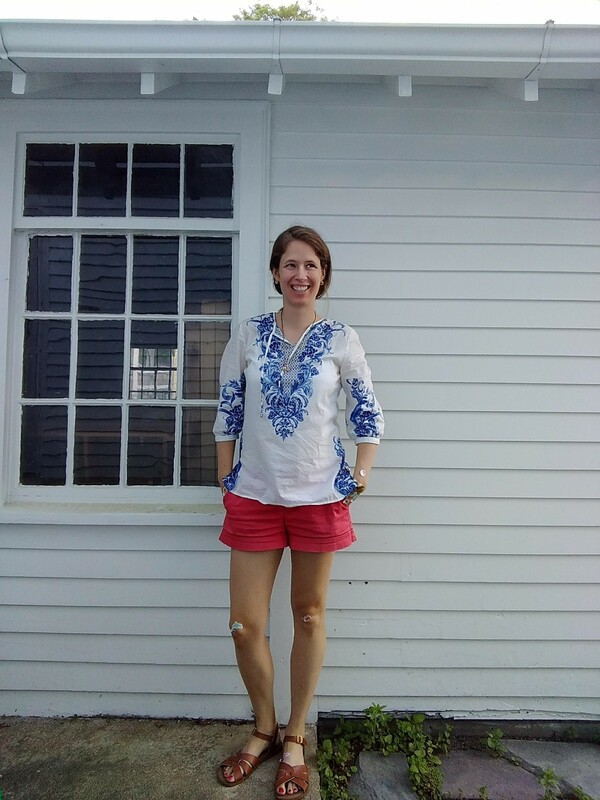 Pull out the pants/skirts/shorts that have always seemed a little loose or needed a belt – they’re your friend when your waistline starts to expand! 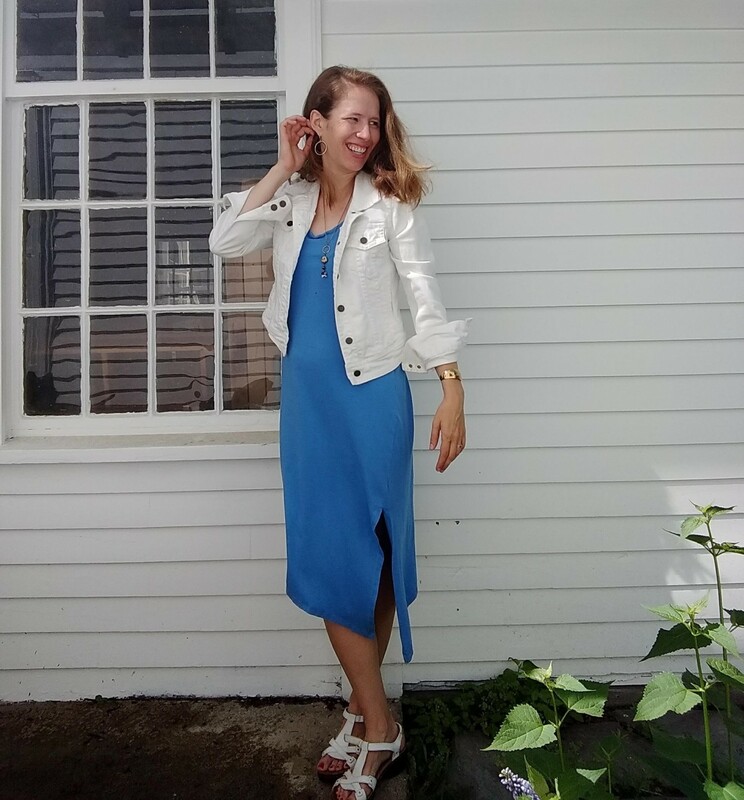 Dresses with any kind of stretch in the fabric are your friend – they can bridge from pre-pregnant through your first few months and give you time to scope out maternity clothes for when things really start popping. Use the rubberband trick to keep regular pants in rotation longer. Hit up maternity consignment stores. This is what I’ll do for my winter clothes because they have the advantage of a) a lot more selection in one place and b) more modern, up-to-date styles. If you don’t want to abandon skinny-cut jeans, for example, go consignment. All I ever see in thrift stores are bootcut styles. Pro tip: many children’s consignment stores have a maternity section that’s worth checking out. Shop secondhand online. Same as consignment, you get a wealth of current style options. Downside: you can’t try on for size and often can’t return, so look for pieces like dresses and stretchy tees that can afford to give a little either way. Look beyond the maternity rack at your local thrift store. You can easily find pregnancy-friendly tunic tops/dresses and skirts/pants with elasticated waistbands in the regular racks; empire waists are also great at adapting to pregnancy. Look in the PJ section for cute shorts for sleep or play, or fashionably oversized pj tops. Size up for regular shirts/sweaters, or snap up one of those normally frustrating pairs of jeans that leaves you swimming in the waist but fits everywhere else. Shoes that are wider than your normal size (particularly sandals, mules, clogs) are a cheap thrift score to give those expanding feet more room. If you’ve thrifted for a maternity wardrobe, what are your strategies and tips? Or any specific season in your life – when you’ll need clothes for a certain purpose but you know you won’t keep them forever? 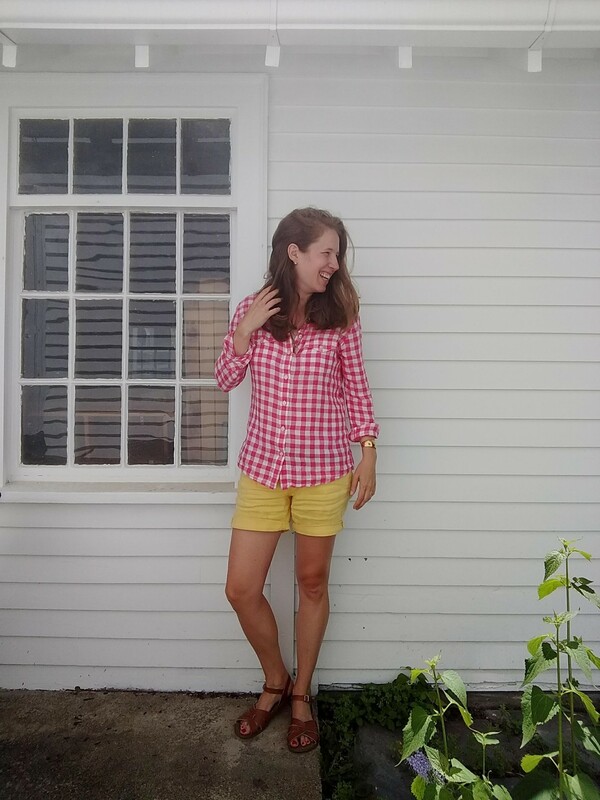 ← Looking for Retail Finds Secondhand – Should I? Um, is that a dolphin sticker on your knee? Thanks Priscilla! Someone at my church just gave birth; the last time I saw her before the baby was born, she said “I’ll be done with all my maternity clothes just in time to give them to you!” I benefited from the same phenomenon last pregnancy; thank goodness women are willing to pass those on! Congratulations! I like that…thrifter #2. Hey Leah – Congratulations! My only was born in December, and by this time I was solidly into maternity clothes. I only gained 13 pounds (was terribly underweight, actually – oh, those were the days! ), but I couldn’t fit into “normal” clothes to save my life. 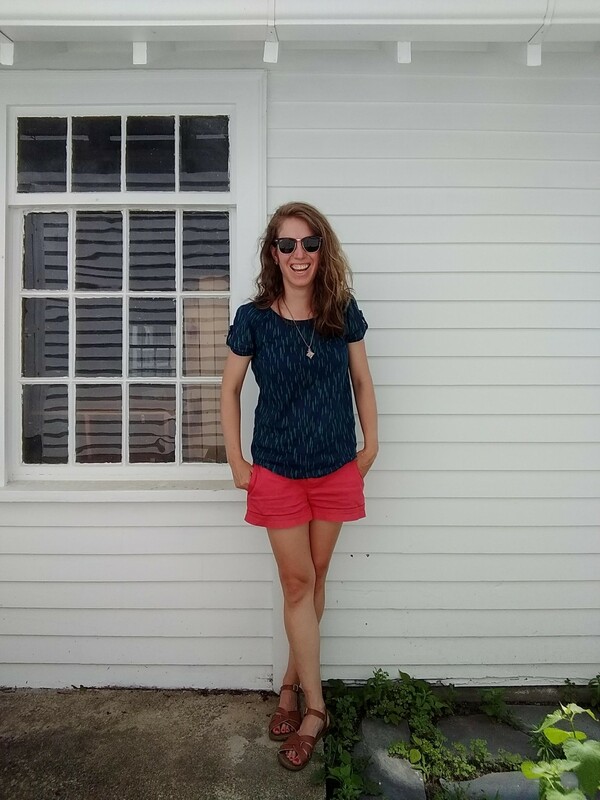 I was too small pre-pregnancy to be able to share clothes, unfortunately, so I had five outfits I rotated and wore awful maternity jeans on the weekends. I am glad to see you have much better options! Thanks Sandi! Good for you for making good use of a small amount of clothing without breaking the bank. 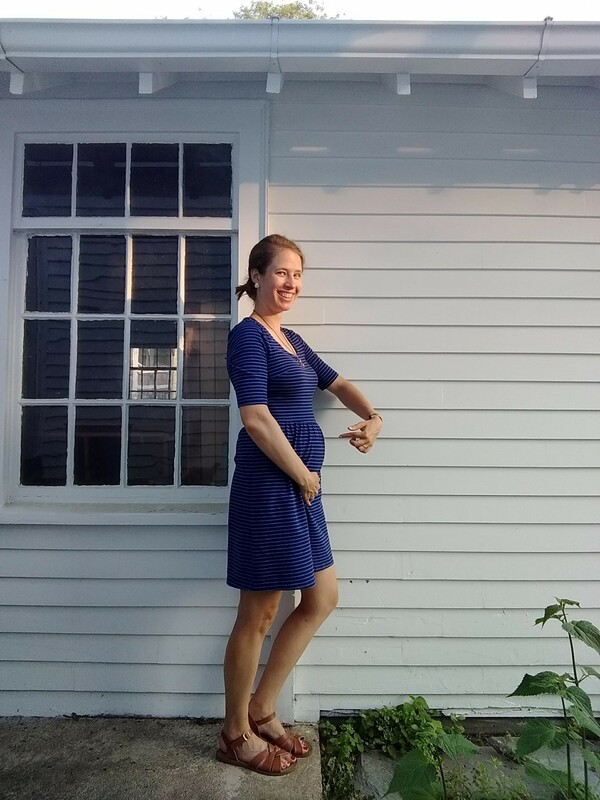 Last time, in my third trimester, I ended up with about the same number of outfits and also got away with one pair of maternity jeans, which I’m hoping to do again this time – nobody really seems to notice and they’re for such a short period of time, relatively speaking. Congratulations! 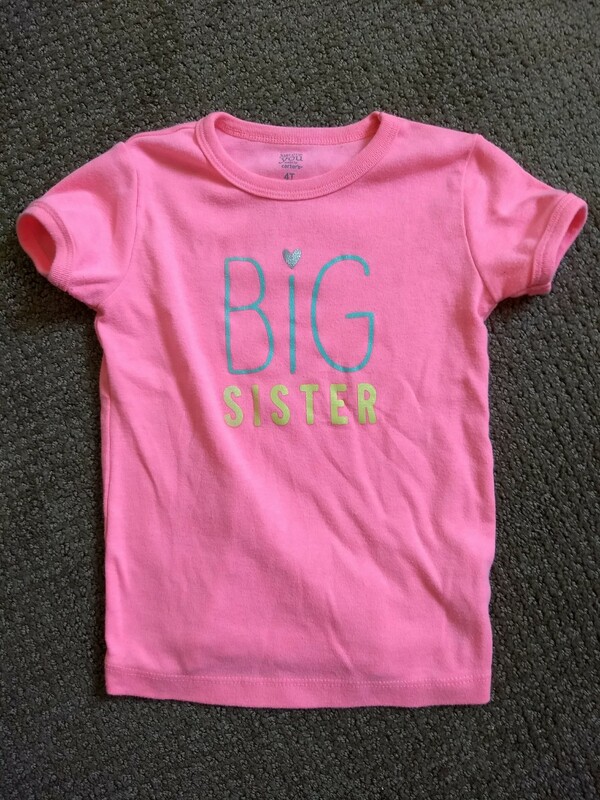 My granddaughter’s sporting the same big sister tee as we await the arrival of her little sister next month :=) Such a pretty, vivid color ! Nursing clothes are expensive and hard to find. And, like maternity clothes, range from super awkward/ugly to really cute. Now’s the time to start looking. If you’re nursing your baby, they can be lifesavers especially in the early weeks. Also think pumping access if that’ll be a need. Not just tops and the rare dress, but cami’s, nightgowns, even barely or never-worn nursing bras. We surprisingly found several and you can kind of guess at what you’ll need if you eyeball and go up a band size and up one or more cup sizes– you’ll be going thru several sizes after delivery until settling down, and you can always give them away again! Ditto for regular shirts that are nursing friendly, like loose fitting tops you can lift or pull aside, maybe with a cami underneath. 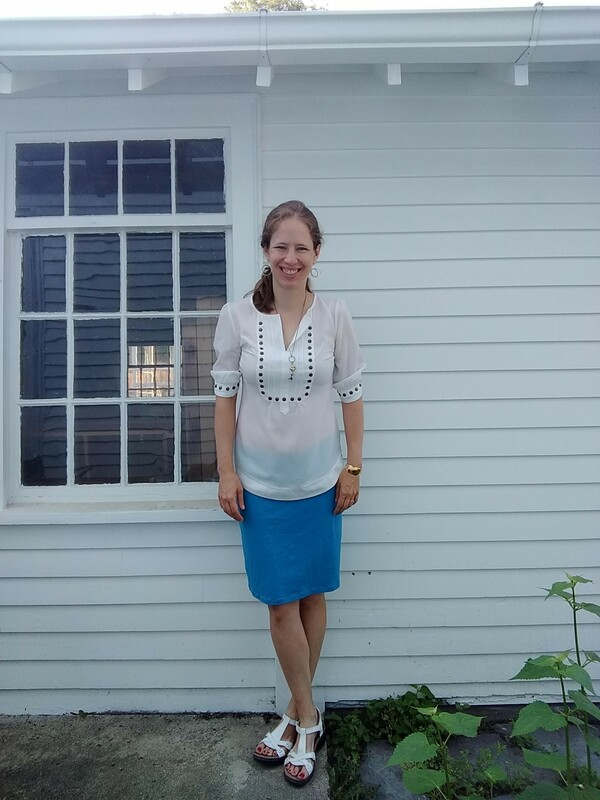 Nursing and maternity clothing is worn such a relatively short but special time– my daughters and I have also found that sharing/passing on is a sweet custom among friends and family. Finally, I’m curious. Why oh why in the world do thrift shops always put scrubs and maternity together? Or is that just a Colorado thing?! You’re so right that maternity clothes often are stuck elsewhere – and that thrifting friends can really multiply your reach. I’m like you – I thrift frequently but have pretty much everything I want, so I *love* keeping an eye out for things other people need. I hadn’t even started to think about nursing-friendly wear yet…those are great tips! 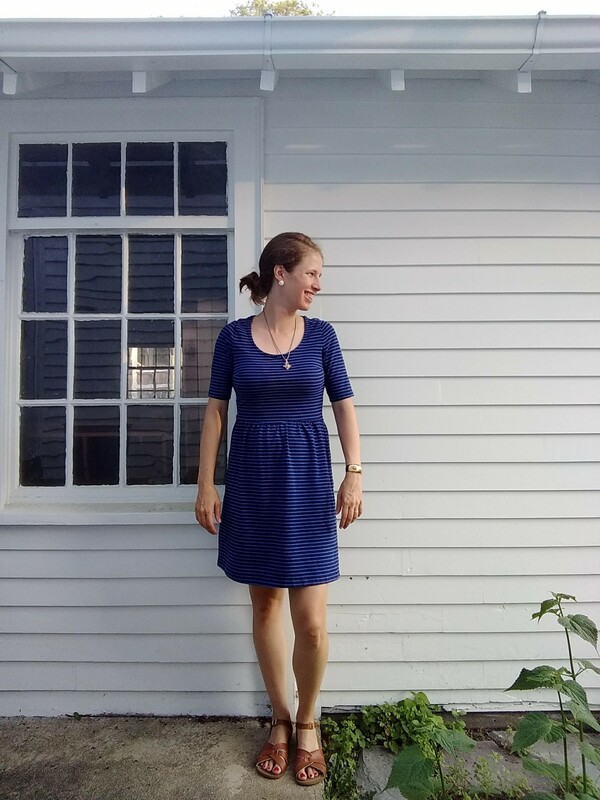 I have (hand-me-down) bras leftover and a few easy-access dresses that I wore in hot weather, but if I’m staying inside most of the time anyway and can wrap a cardigan around a sleeveless dress, it hopefully won’t matter! You’re adorable. Also I love the dolphin knee sticker. I was scrolling through my Facebook feed like ‘aw look at that cute little mama belly’… then it dawned on me that it was you. Love the post. It made me crazy buying clothes I would only wear for 4 months. Especially when I had several weddings (in different climates) when I was pregnant. I just gave all my maternity stuff to my SIL. Because free clothes are even better than thrifted ones, right? Thanks Megs! Dolphin sticker on my knee (which I either didn’t notice or forgot to take off before the pic) is so emblematic of my life right now. Free clothes for the win! So much good stuff to be had, particularly for a time in your life when what works is far more important than spending time and money finding what’s perfect. I bet your SIL loved the opportunity to find some good stuff! Congratulations! Sorry I’m late to the party here – summertime yard work has become an intensely loathsome chore – but this happy news was so lovely to read. Quick flashback – when I was pregnant with my kids wa-aa-y back in the early ’90’s, the maternity “fashions” were hideous beyond belief. Lots of 1980’s Princess Diana influenced sweet pea type ruffled dresses of the hugely floaty variety. Thank God my mother was an excellent seamstress and sewed me some very simple and really beautiful dresses. Lots of linen and cotton which I appreciated, being pregnant both times during a Midwestern summer. I also found some items in our local Salvation Army (really plain tent dresses and oversize cotton button-down shirts) that saw me through. After my second baby, I knew I wasn’t going to have any more children, so I donated all my maternity clothes. I still enjoy looking back at pictures from that time and trying to believe how fast time flies! 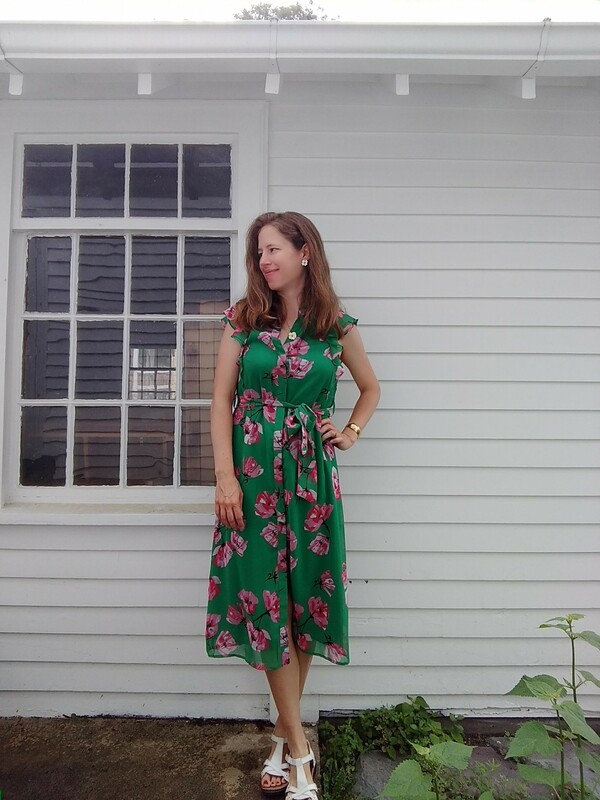 It’s funny, maternity clothes have tended toward stretchy and body-hugging for the last while, but I’ve started to see a few of the looser, floaty “tent” dresses come back into style (though minus the ruffles). Especially in a hot summer it makes so much sense – particularly the linen and cotton dresses your mom made for you which sound just divine! I love that you have pictures to look back and remember both the fashion and the fun of growing a person. Thanks for sharing.